MI lovers, MI Republic Day sale is here. In this sale, customers will get up to Rs 3000 off on selected handsets of MI. Not only this, Bigbazaar is running a sale as well known as BigBazaar sabse saste din. In this sale, You can get a discount on some Redmi phones as well. But for Redmi 5A, you will get Rs 1500 Cashback. Redmi 5A is already the cheapest 4G phone among all Redmi phones. This cashback offer is only available at BigBazaar, Customers buying Redmi 5A from BigBazaar will get a cashback of Rs 1000 and By paying via Axis Bank credit/Debit cards, Customers will get RS 500 cashback in their Axis Bank account. You need to buy Redmi 5A from the offline stores of Big Bazaar. However, The offline price of Redmi 5A is Rs 5499. So after getting a cashback of Rs 1500, This handset will cost you around Rs 3999. Mi/Redmi phones on which huge discount is offered during the MI Republic day Sale. 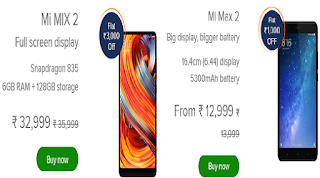 There is a huge discount on MI phones on the official site of MI. However the maximum discount is Rs 3000. Customers will get Rs 500 discount on Redmi 4, Which has 4100 Mah battery. It also has three variants as per the storage capacity and RAM (2GB+16GB, 3GB+32GB, 4GB+64GB). On Redmi Note 4 customers will get a discount of Rs 1000. This also has two variants as per the storage capacity and RAM (3GB+32GB, 4GB+64GB). Effective price is Rs 9999 for the 3GB + 32GB variant and Rs 10999 for 4GB+64GB variant. On Mi MIX 2 customers will get flat Rs 3000 discount during MI Republic day sale. So the effective price of Mi MIX 2 is ₹ 32,999, While as the actual price of the Mi MIX 2. While as the notable thing about Mi MIX 2 is that it has a RAM of 6GB with a storage capacity of 128GB. However, on Mi MAX 2, Customers will get flat Rs 1000 discount. So the effective price of Mi Max 2 is Rs 12999 for 4GB+32GB and Rs 14999 for 4GB+64GB variant during the MI Republic day Sale. On Mi A1, Customers will get a discount of Rs.1000 flat. 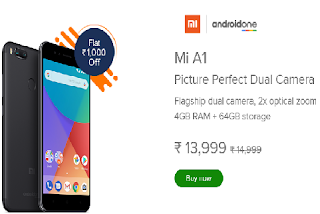 So the effective price of Mi A1 will be Rs 13999 during the MI Republic day Sale . Mi A1 is commonly known for its dual primary camera. Also, Redmi is the company which wants its customers to be satisfied with their service, That’s why Xiaomi Redmi is soon going to release the most demanded oreo update for Redmi Mi A1 users. What is the MI Republic day Sale period? MI Republic day Sale is live from 24-26 January on the official site of mi. However, The sale period can be extended at any time. But for BigBazaar’s Sabse Saste din sale, The sale period is for 5 days from 24-28 January. Are There any other offers during the MI Republic Day Sale as well? Yes, Besides the above-mentioned offers, There are some discounts on the accessories as well. You can get a discount of Rs. 200 on selected accessories. However, some general offers for all the Mi/Redmi phones are also there. Customers buying any MI/Redmi phones will get a free Hungama music subscription for three months. Also, customers will get SuperCash up to ₹4000 with Mobikwik. But there are some terms and conditions as well. Microsoft launched garage favorites screen lock android app.